The view from the top row of the Top Deck. Heading up this evening to the ravine for a special batting practice and simulated game to which season tickets holders — such as myself — were invited. It’s my first chance this year to visit the most beautiful stadium in Major League Baseball, and I’m very much looking forward to it. Particularly after last year’s boycott. 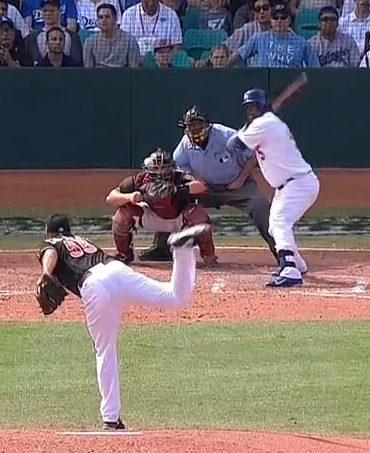 Yasiel Puig sneaks a sly peak at a pitcher. Bill Plaschke, in the L.A. Times, says Mattingly needs to rein in the wild right fielder whose penchant for driving fast is matched by his penchant for living fast and playing fast. He is young and spoiled, and also very talented. But talent only counts if you know how to make the best use of it. He needs to perhaps learn to slow a bit and think a moment before acting. 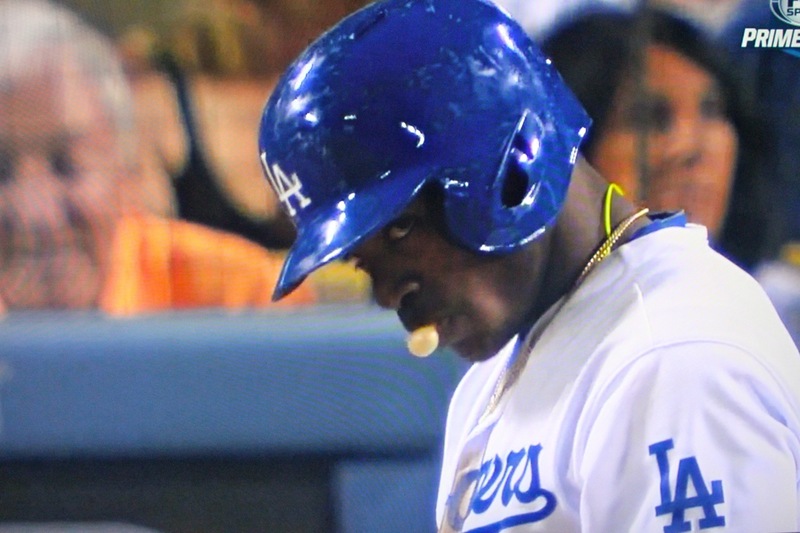 So even though Plaschke sounds like a scolding shrew, I tend to agree with him about Puig needing less coddling. 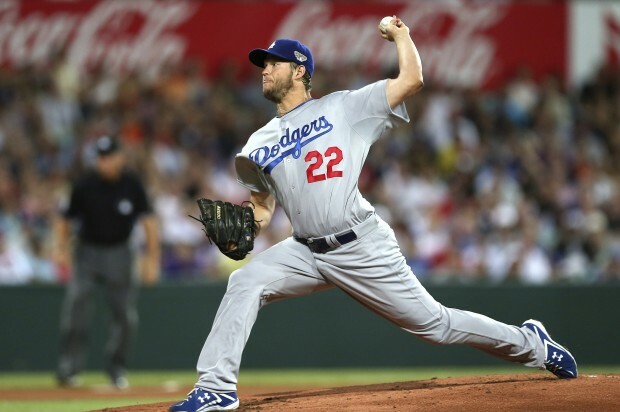 As Dodger management’s golden boy, we’ll see if $tan Ka$ten has the balls to say no to him, or to let Mattingly do it. Relief pitcher Javy Guerra was claimed by the White Sox off waivers from the Dodgers. There was a time he was lights out and had a shining beacon of a smile to match his promise. Good luck in Chicago, Javy. 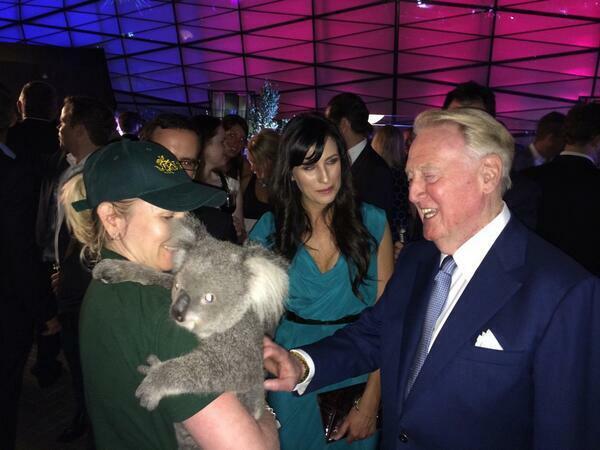 Before I get to the game, I have to warn our beloved Vin Scully about those koalas. As you can see, Vin cuddled up to a cute little marsupial while visiting Sydney. Adorable as all get out, but dangerous as hell. Problem is, there is an epidemic of chlamydia running rampant in the koala population, as reported last year by BBC News. And they say that, yes, it is transmittable to humans through direct contact. Here is a link to the Australian Koala Foundation if you want to donate to help save the most darling little animals. Dodgers third-baseman Juan Uribe connects for a double. Happy Birthday, Juan Uribe! You were one of three Dodgers to have a trio of hits in a 7-5 victory over those Arizona vipers. Yasiel Puig and the amazing Dee Gordon (13 pounds heavier than last year, according to Vin Scully) also got three hits each as the boys in blue amassed a whopping 7-0 lead behind pitcher Hyun-Jin Ryu. It looked like such clear sailing that I was getting a little bored, that is, until the bullpen took over. Good thing the Dodgers are not playing again until Thursday’s freeway series game against the Angels, because they burned through their relievers, and most of them didn’t do so well. What seemed like a stroll through the park turned dangerous there at the end, as the D’backs scored four runs in the final inning, including a two-run dinger off the first pitch by Golden Boy closer Kenley Jansen. Yikes! But on the bright side, the Dodgers start the season with a sweep of those dastardly Diamondbacks, whose love of hitting batters hasn’t abated at all. Both Puig and Gordon got plunked, and I doubt it’s a coincidence that they were both guys hitting well. Geez, Louise! As if a 1 a.m. start wasn’t bad enough, by the time the weather delay was over, first pitch happened at 2! I made it through the first inning, and then conked out, but I did rouse just in time to watch Scott Van Slyke’s two-run dinger. Nice start to the season, a 3-1 win. While Van Slyke went 2-3, including aforementioned homer and a double, I was dismayed to learn that most of the other regulars (Uribe, Puig, Ethier, Ramirez and Ellis) had 0-fers, a bad sign for our offense, but I’ll chalk it up to jet lag. New guy Justin Turner, playing second base, got one hit, Adrian Gonzalez slugged a double, and Clayton Kershaw helped his own case with a single. I valiantly struggled to stay awake long enough to watch Kershaw’s 6⅔ innings, but it was weird watching baseball while the rest of the Valley slept. In the end, it sounds like everything after the two-run fourth inning was a snoozefest anyway, so I’m glad I managed to catch some Zs and didn’t end up a basket case today. So, that’s one down, 161 to go. Yay! Baseball is back!